These keto meatballs are coated in a simple 2 ingredient BBQ sauce. These meatballs make a great appetizer, but they're also good served over mashed cauliflower. Preheat oven to 400 degrees. Spray a large baking sheet with non-stick spray. Add the ground beef, pork rinds, egg, cheddar, cream, water, salt, pepper, and garlic powder to a large mixing bowl and mix well to combine. 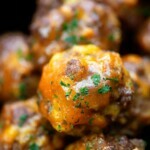 Roll the meat mixture into 15 small meatballs and place on the baking sheet. Bake for 15 minutes or until meatballs are cooked through. Whisk together the ketchup and salad dressing. Brush over the meatballs. Return the meatballs to the oven and turn the broiler to high. Broil for 1-2 minutes or until sauce just begins to caramelize.